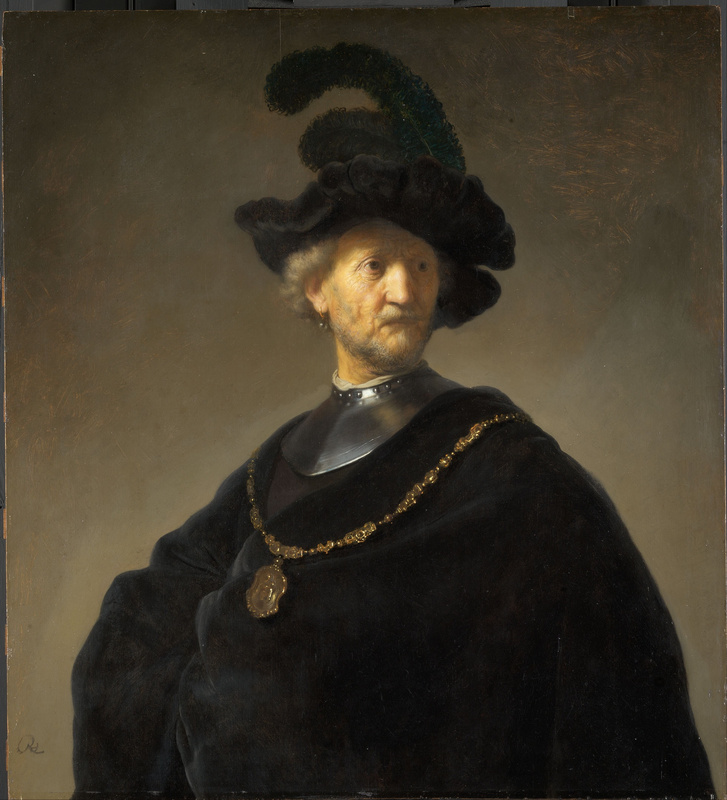 Two portraits by Rembrandt are visiting the Art Institute from the Norton Simon Museum in Pasadena, California. The paintings, Portrait of a Boy and Self-Portrait, join the Art Institute’s own Old Man with a Gold Chain and Young Woman at an Open Half-Door (from Rembrandt’s workshop) for a look at Rembrandt’s approach to portraiture—one that is decidedly more complex than it may first appear. Taken together these four paintings show Rembrandt’s brilliant skill as a painter, especially as a painter of people, as well as his deep knowledge of historical subjects and art history. His use of artifice and costumes not only celebrates a historical genre but also anticipates a future in which identity is something created by the artist, and humanity is expressed by everyday people. The focus exhibition is on display at gallery 213. The earliest of the paintings, Old Man with a Gold Chain (1631), is a bust-length painting of an elderly man. Rembrandt depicted this model so frequently that many assumed he was the artist’s father, though no evidence for this claim exists. The man is richly dressed in a sumptuous black velvet coat and feathered hat, sporting a gold-hoop pearl earring, as well as both a heavy gold chain and steel gorget around his neck. While these latter adornments were often used in Renaissance portraits to indicate actual military accomplishments, in Rembrandt’s painting they are mere theatrical props, which along with the dramatic lighting imply that we are to understand the work as a type of character study (called a tronie) rather than as a true portrait. In his Self-Portrait of 1636–38 from the Norton Simon Museum, Rembrandt similarly portrayed himself in three-quarter profile, thoughtfully making eye contact with his audience from under a knitted brow. Although his likeness is faithful and familiar, his pose is affected, his left hand tucked into the breast of a costly and elaborate jacket. His attire once again harkens back to costumes from the previous century, a way to align his painting with Renaissance portraits intended to elevate the status of painters, who had long been regarded as craftspeople rather than as proper artists. His well-off and aristocratic appearance is aspirational in regard to his economic means as well: at the time Rembrandt was hovering on the brink of bankruptcy. Again, dramatic lighting underscores the artificiality of the work. Portrait of a Boy, also visiting from the Norton Simon, has a similarly imaginative nature, showing a boy with a roughly sketched pet, perhaps a bird or monkey, on his left shoulder. His ornate garb—a plumed hat and lace-collared shirt—is again from an earlier period. And yet despite the theatrical costume and inclusion of the exotic pet, the portrait comes across as frank and honest. The boy, illuminated by a soft light that falls evenly across his face, engages us directly with his shining, round eyes. The portrait may be unfinished—affording a rare glimpse of the artist’s hand at work—but the boy’s expression is anything but incomplete. Costuming plays less of a role in Young Woman at an Open Half-Door by Rembrandt and his workshop; instead it is the way in which the young woman interacts with the viewer that complicates the work. Paintings in which the subject greets the viewer at a shop or house door are not uncommon; indeed they date back to the Renaissance. However, in the Art Institute’s painting, the woman does not directly acknowledge us as a dear friend or valued customer but rather leans forward out of the door and, seemingly, out of the picture plane. Placing her hands firmly on the wooden ledge in front of her, she creates a physical barrier between herself and the viewer. At the same time, she looks askance, her face half-shrouded in darkness. While the image is a “portrait” of a young woman, it also gives the subject herself agency. She is clearly directing her gaze elsewhere, but to whom or to what?